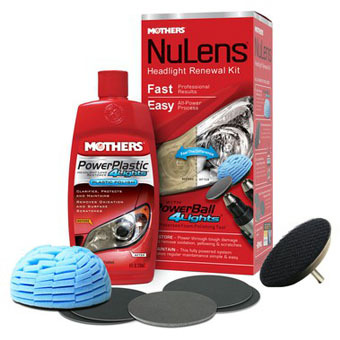 Mothers® Nulen™ is a DIY headlight lens restoration kit that is designed to quickly and safely restore, maintain and protect all types of smooth, shiny plastic and acrylic headlights to crystal clarity. It easily cleans away yellowing and stains, and even buffs out unsightly hairline scratches, smudges, and flaws in a single step. The included PowerPlastic 4Lights® polish restores crystal clarity, leaving a tough protective, oxidation-inhibiting polymer layer to guard against future degradation from the elements. 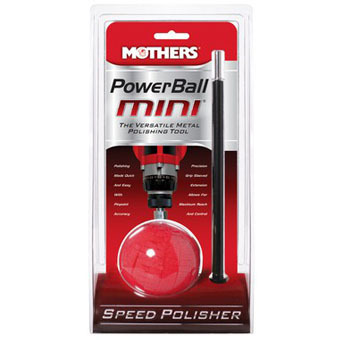 The Mothers® PowerBall® is the original foam polishing tool designed to revitalize billet, diamond plate, polished aluminum and stainless steel. Ideal for use with our aluminum, billet and chrome polishes. Its unique and durable construction compresses to fit tight spaces, so polishing difficult, intricate metalwork to a mirror-like finish is fast and easy. The PowerBall Mini® takes your intricate, hard to reach, tedious polishing jobs and makes them easy. It retains the PowerBall’s® signature speed, ruggedness, and versatility, while adding reach and pinpoint accuracy for those knuckle-busting jobs. It’s perfect for polishing wheels, diamond plate, taillight lenses, engine components, and much more. 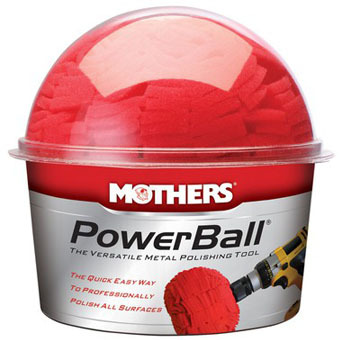 PowerCone® expands Mothers® PowerBall® line to offer the widest range of polishing possibilities. It makes quick work of any uncoated, polishable metal finish, no matter how intricate the design. Its ingenious conical shape provides an infinite range of sizes — ideal for getting into tight, difficult-to-reach areas. And the PowerCone's® long tapered side is perfect for polishing broad, curved surfaces. 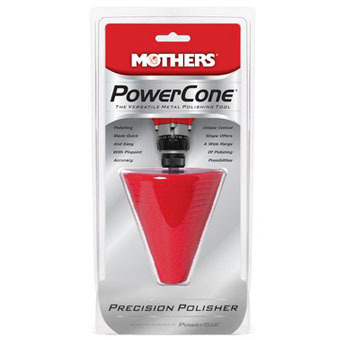 Combined with Mothers® metal polish, the PowerCone® gives you a deep, mirror-like shine in less time.